A spine-tingling tale of book bonding. In this wordless story, a little boy finds a book that he loves at the library. It’s a match made in kid lit heaven. But not for the book. Sometimes the little boy’s excitement gets the better of him and the book suffers from possibly too much love: bent pages, tears, hugs, tossing, and shaking. The poor book requires first aid from his friends. Every time the boy comes to the library, the books hide and plan escape routes. But when the book gets away from imminent danger in the boy’s hands, the look of loss in the boy’s eyes is enough to turn a tragic tale into a love story. The boy soon learns that the book is not just an object and is so much more on the inside. He loves the story the book gives him more than the fun he had playing with it. Bob Kolar’s charming and hilarious illustrations show how sometimes our love for a good book can be too much, but with a more gentle touch, books can give us much comfort and joy. David Michael Slater’s sixteen picture books include Cheese Louise (Walrus Books, 1999), The Ring Bear (Flashlight, 2004), Jacques & Spock (Clarion, 2004), and Flour Girl (Magic Wagon, 2007). The Bored Book (Simply Read Books, 2009) was reviewed positively in The New York Times. David’s collection of short fiction for adults, The Book of Letters (Evermore Books, 2010), includes "The Last Lottery," which was nominated for a Pushcart Prize. His ongoing YA series, Sacred Books (Blooming Tree Books, 2008–present), is being developed for film by producer Kevin Bannerman (Lion King/Curious George) and screenwriter Karen Janzsen (Dolphin Tale). David lives in Reno, Nevada. *A nearly wordless picture book presents the "I can read" moment. A small boy with a determined, mischievous expression enters a library in the company of his mother. The look on the boy's face, perfectly rendered by Kolar (as are all the expressions), alarms the library books, and they run for their lives. The boy captures a blue-bound book and begins manhandling it as he would any toy, in the process ripping and creasing the pages. The other books look on, horrified. The boy's mother (who, unsettlingly, seems to care not a whit that the boy has mistreated a book) comes to get him. He tosses the book to the floor as he leaves. The other books lovingly glue and tape the battered book back together. A new day, and—horrors!—the boy returns. Again, the books scatter. But then the blue-bound book sees the boy's forlorn expression and suddenly understands. The book leaps from its safe perch to the boy, the boy opens the book, and it is here that the four words of text make their powerful statement—"Once upon a time." For the boy has learned to read, and now books are cherished and library manners learned. 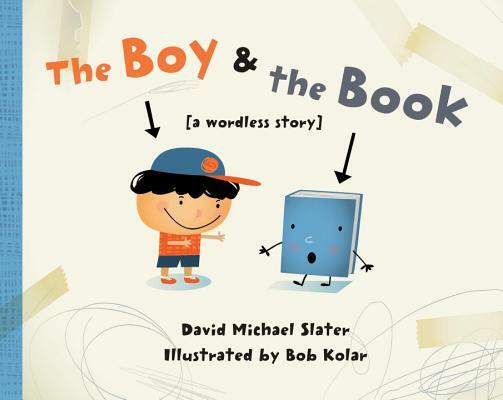 Slater's (The Bored Book) wordless story seems headed toward a lesson about mistreating library books, but the lesson turns out to be one of surprising compassion. The book abuser is a young library visitor with a mop of black hair who grabs a blue book while the others flee (all of the books have expressive faces and sticklike appendages). A question mark above the boy's head as he opens the book signals his non-reader status. Instead, he holds it upside down, rips it, tosses it, and folds the pages, accompanied by anguished looks from the book itself. On a return visit, the book's efforts to avoid the boy are futile, and he strikes again. But then something wonderful happens: the boy learns to read, and he and the book are reconciled. Kolar's (Stomp, Stomp!) digitally made figures are crisp and flat, and the expressions on the books' faces do their comic work effectively. Library champions don't usually tolerate the ill-treatment of books, but sometimes, Slater implies, what looks like bad behavior is just boundless eagerness.